Noisa – WordPress Music & Events Theme Created by rascals. This templates have specific characteristics, namely: Noisa has features such as High Resolution: Yes, Widget Ready: Yes, Compatible Browsers: IE10, IE11, Firefox, Safari, Opera, Chrome, Edge, Compatible With: WooCommerce 2.6.x, WooCommerce 2.5, Visual Composer 4.11.x, Software Version: WordPress 4.6.1, Columns: 4+ . 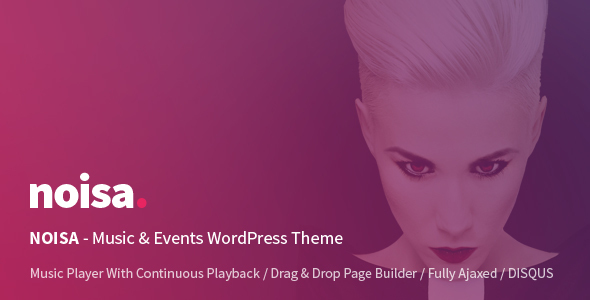 You can use this Noisa – WordPress Music & Events Theme on WordPress category for ajax, artist, band, best, dj, event, festival, music, music band, musician, responsive, singer and another uses. New intuitive layout. Experience layout which is always handy to use – No matter if it’s displayed on PC, tablet or mobile phone. SoundCloud API support (more can come if there will be a high user request). You can add tracks to playlist directly from SoundCloud as simple as they would load from local resources. Dynamic Playlist… You can add special links via HTML which will be able to dynamically load additional content to player playlist, of course without any break in music playing. Playlist that is able to load even hundreds of tracks. Only limit for the Scamp Player playlist size is the speed of browsing machine (client side). Covers for tracks. Every track in playlist can have its own cover image. Responsive layout and compatibility. If we speak about mobile devices, there is no worry that Scamp Player won’t work or display properly on any popular device used today. With our Event Manager you can set repetitive and multi-day events. You can use counter which will countdown time to next event. In events archive they will be automatically switched from future to past after they will occour. Localization of every single event can be shown by Google Maps integration. Background Generator – Simple way to create a different background header for each page, post…etc. Slide Panel – NOISA comes with a slide widget area. There is an invisible scroller implemented. Also, it is automatically closing itself after page loaded. Integrated comments from DISQUS. You can turn them off in admin panel. Releases (drag drop ajax sorter). Artists (drag drop ajax sorter). Slider (drag drop ajax sorter). Tracks Manager (drag drop ajax sorter). Tracks – Displays tracks (single track, tracklist or tracks grid). Twitter – Displays latest tweets. Gallery – Displays albums or images from gallery. Full localization – template and administrative interface. You can easily translate them to your own language. Cross browser compatible – Our main goal was to create a template layout which is highly compatible with almost all of the browsers like Internet Explorer, Firefox, Safari, Opera, Chrome etc. Cross browser compatibility and W3C validation of our themes are crucial in the successful running of the website. WooCommerce pages are not fully ajaxed, because plugin is not compatible with this technology. The player uses the session storage so you can be sure that you don’t lose tracks when you refresh browser. The images included in preview are for demonstration purposes only. In case that you import dummy data, you will have placeholders instead of images.